A former national political editor has credited his career to the regional daily where it began as he bowed out of the industry. Philip Webster, left, who is leaving The Times after 43 years, says he owes the Eastern Daily Press for giving him a “terrific grounding” in journalism. 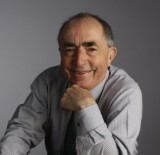 Philip served as the political editor of The Times from 1993 until 2010, but continued to work for the newspaper’s digital operation until recently. In an interview with the EDP’s political editor Annabelle Dickson to mark his retirement, the son of a Norfolk farmer recalled being given his first break by the newspaper after receiving a phone call while backpacking around Europe. He was sent by the EDP’s editor-in-chief Alfred Jenner on a full-year journalism course in Harlow, where he befriended future Dire Straits frontman Mark Knopfler – who himself worked for the Yorkshire Evening Post prior to finding musical stardom. Afterwards, Philip began working for the EDP in Lowestoft. He was later based in Diss, where he was once chased away with a pitch fork while in search of a potential scoop. Philip had read of someone locally who had volunteered to be a midwife for controversial Ulster MP Bernadette Devlin – a catholic – who became pregnant with an illegitimate child. Said Philip: “The EDP gave me the most terrific grounding in journalism, they gave me the opportunity of one of the very first pioneering full-year journalism courses and three years of proper reporting and a bit of subbing as well. After moving to The Times, he worked his way up through the paper’s political ranks, becoming political editor in 1993. There he covered the Tony Blair and Gordon Brown years, and also broke the new sin 1997 that the UK would not be joining the European single currency. After leaving the political editor post in 2010, he edited The Times website and his last 18 months on the staff saw him pioneer the Red Box project – a new website and daily briefing with podcasts and analysis which has already attracted 40,000 subscribers in its short life. He will continue to contribute to the paper on a casual basis, and spend more time following Norwich City FC – whose games he attends with former Shadow Chancellor (and the club’s current chairman) Ed Balls, as well as former Minister Norman Lamb. Congrats on the retirement Phil.